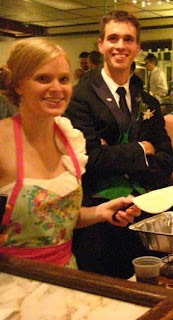 Ever since (my now-husband) Joel proposed on May 1st of 2010 (and let's be honest-- even before that...), I've had wedding/marriage on my mind and way up near the top of my to-do list. Through the whole process, my honey and I have done our very best to focus on preparing for marriage, not simply planning a wedding. All that to say, we did things a little bit differently. 1. I bought my dress used. I couldn't stomach paying an insane amount of money for something I would wear one time and then keep in a box for the rest of my life (or until I got fed up and took it to the thrift store!). 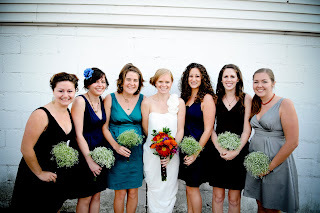 Plus, I've done a lot of blog stalking & knew the website Once Wed had a section for used wedding dresses. I found one I loved, went to the store to try it on, and purchased it for half price from a girl in my area. We met at the mall one morning, I gave her the cash, and she handed over the dress. All I had to do was have it steam cleaned. I also know someone locally who does sewing repairs so I had her put in a place to bustle the dress in the back. 2. We invited every single person we wanted to invite. We decided from the beginning that people were a high priority so we didn't cut the guest list at all. We just made other adjustments. It was SO special to celebrate the day with all our friends and family! 3. Our time was spent mostly listening to each other and planning our future. I can only remember a few specific conversations where Joel and I were talking about mundane wedding details. During the last six months we talked a lot about marital roles, expectations, fears, and the anticipation of spending our lives together. We also had six weeks of awesome pre-marital counseling led by the pastor who married us and his wonderful wife. 4. Traditional wedding food = way too expensive and unoriginal for our tastes. I was at Qdoba one day this past summer and noticed that they did catering... BRAINSTORM! Qdoba is one of my favorite places to eat, so why not have it at our wedding?! We ordered a hot naked burrito bar for 166 people. The cost was roughly 9 dollars per person, including plates, napkins and silverware. 5. 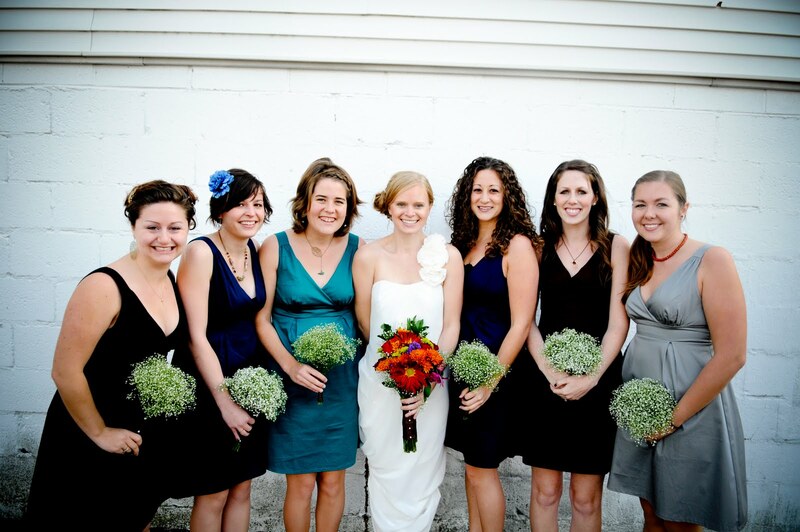 Our bridesmaids all had the same dress in a different color. They ordered them online at Target for 30 dollars. They looked SO awesome and I couldn't be happier that they were inexpensive and wearable for future events. Our groomsmen wore suits they already owned. The idea of renting tuxedos for a day, which costs about the same as purchasing a new suit, made me cringe. 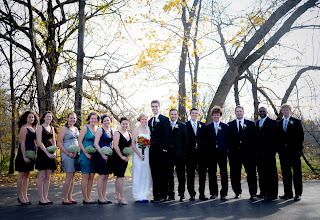 Joel's groomsmen looked totally rad and you couldn't tell that some had black, some had gray, and some had navy. 6. We served dinner ourselves. 7. Our photographer was a friend of my bridesmaid. She was absolutely perfect because I had in mind mostly candid photos, a very short bride/groom photo shoot, and quick, fun pictures of our wedding party. All in all, "official" photos took one hour. 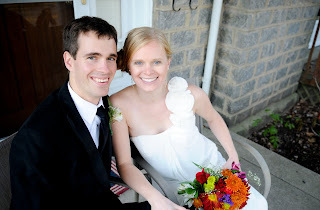 She also gave us a great deal and shot our wedding for much less than she usually charges. 8. 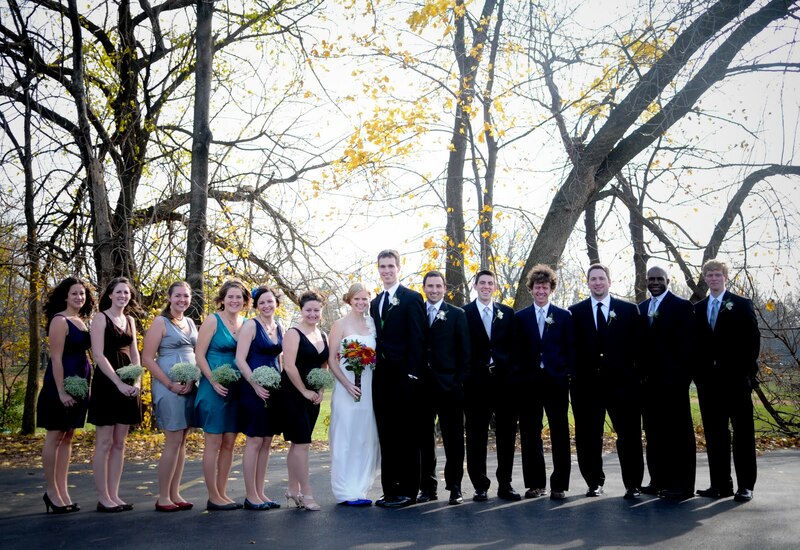 The bride, groom, and bridal party all got ready together. OK, so I totally understand the whole wanting to have that moment of sheer joy/surprise when seeing each other as the bride walks up the aisle. We sacrificed that a little, I suppose, but it was totally worth it to have everyone getting gussied up all at the same time at the same place. We're very fortunate to live right next to our church, so we could all walk to the ceremony straight from our house. There was no running back and forth to grab forgotten supplies, no stress of people arriving late. 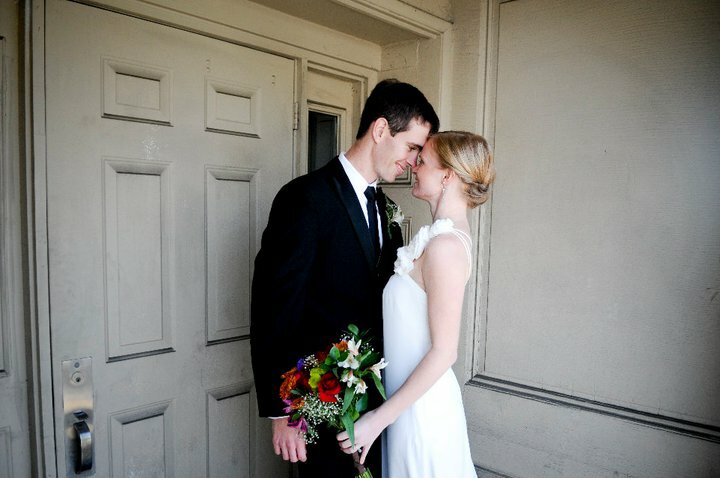 Plus our first look at each other was quite special, even without hundreds of people witnessing it. 9. Our wedding favors = kazoos. You can buy personalized kazoos online for about a dollar per person... cheaper than most traditional wedding favors. Plus, on our second date we went to a goofy outdoor concert and they gave us kazoos so we could hum along with the music. I threw mine out (of course) but Joel kept his and a few months later I noticed and felt all sentimental that he still had it. 10. We had a wonderfully hilarious photobooth. Our friend let us use her SLR & tripod. We set it up with a vintage sheet as the background and left it running throughout the reception. The pictures from the photobooth continue to make me incredibly happy. It looks like everyone was having SO much fun! 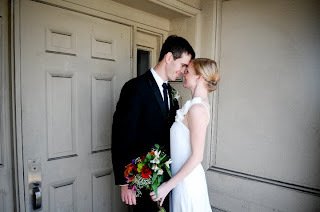 Eight weeks into marriage, I have absolutely NO regrets about how we did our wedding day. The lessons we learned, the laughter we shared, the money we spent (and saved! ), the conversations we worked through... all made the before, during, and after completely wonderful! Oh man, I LOVE that you used Qdoba! I always thought it would be fun to get our local pizza place (where we had our first date) to cater, but I'd never heard of anyone doing anything like that until now.